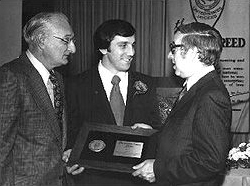 In 1973 the Jaycees honored Larry with the Distinguished Service Award for the Outstanding Young Man of the Year in the Bethlehem Area. His other community activities have included American National Red Cross, Bethlehem Recreation Commission, Bethlehem Saints Knee-Hi Football, Bethlehem YMCA, Lehigh County Big Brothers which included being a Big Brother, also served on the board of NEW Big Brothers/Big Sisters of the Lehigh Valley, Northampton County Prison Society, Better Business Bureau, Mayors Task Force in Bethlehem, Bethlehem Boys Club, Bethlehem Halloween Parade, Bethlehem Jaycees, March of Dimes, Rotary Club of Bethlehem, Family Answers, Special Olympics of PA, KidsPeace, and he is a Past President of First Night Bethlehem and the Greater Bethlehem Area Council of Churches. an AUTHORIZED DEALER, Kaeser & Blair.